Winners from L-R: Chloe Tiffany, Zimri James & Precious Sapphire, Datuk Masidi Manjun. Sabah Tourist Association recently launched the Digital Map of Sabah, named Eyes of Sabah, a first of its kind; in conjunction with the closing and awards ceremony of its Sabah Young Tourism Ambassador (SYTA) program on the 16th December 2011. The ceremony started off with the arrival of the Guest of Honor, Datuk Masidi Manjun at about 3.00pm. A video presentation of the Sabah Young Tourism Ambassador program was then played for all to watch, followed by a speech by the Organizing Chairperson, Miss Heneritta Gunting. Shortly after that, the launching of the Digital Map was officiated by Datuk Masidi and also followed by a speech by the STA Chairman, Tonny Chew. The top 10 finalists were then presented with certificates, and a video presentation of the final interview was played. As soon as the video ended, the moment everyone was waiting for finally came. All 10 finalists were called on stage again, and the winners were announced. 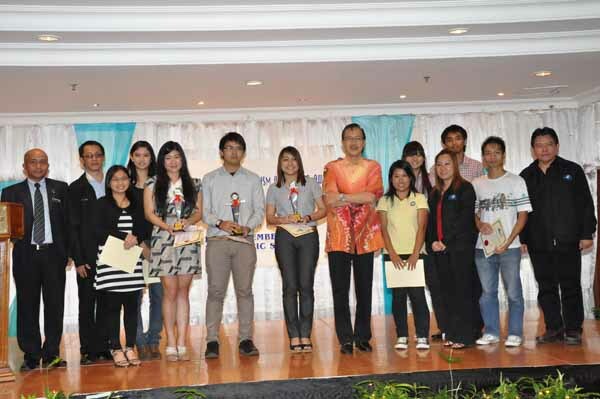 Datuk Masidi presented the trophy, certificate and prize money to all three ambassadors for the term 2011/2012. The ambassadors will be taken to various places for familiarization and site inspection. From these visits, the young ambassadors will do a write up of the place and post on the STA blog, Facebook page and Twitter which will be accompanied with photos of the site and its key attraction. They will also link the associated website of said destinations in their blog posts. The ceremony then ended with a closing speech by the Guest of Honor, and resumed with high tea and networking session between members.